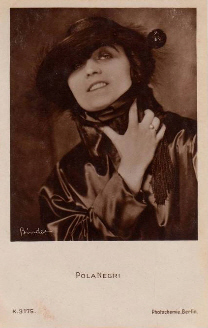 The actress Pola Negri was born as Barbara Apolonia Chalupec in Lipno, Poland. For the film she made her debut two years later with "Niewolnica zmyslow - Liebe und Leidenschaft" and already personified the type vamp with which she should become famous. After some more Polish film productions she went to Germany in 1917 where she achieved first glorious triumphes. Sie appeared among others in the movies "Die Augen der Mumie Ma" (18), "Carmen" (18), "Vendetta" (19), "Madame Dubarry" (19), "Sumurun" (20) and "Die Bergkatze" (21). The movies made one of the greatest stars of Pola Negri und she soon belonged together with Henny Porten and Asta Nielsen to the triumvirate of German artists. The movie "Madame Dubarry" was also a great success in the USA and Adolph Zukor obligated her for Paramount. In 1922 Pola Negri went as the first German actress to the USA where she made her film debut in the new continent with "Bella Donna" (23). The success remained true to her in America too and she achieved her greatest triumphes with "Forbidden Paradise - Das verbotene Paradies" (24) and "Hotel Imperial/Hotel 'Stadt Lemberg'" (26). To her further movies in the USA belong "Shadows of Paris - Schatten von Paris" (24), "East of Suez - Opfer des Blutes" (25), "Flower of Night - Die Königin der Nacht" (25), "Good and Naughty - Wie werde ich meine Frau los?" (26), "The Secret Hour - Die geheime Stunde" (28) and "The Woman He Scorned - Die Strasse der verlorenen Seelen" (29). Beside it she made the headlines with her numerous affairs. In 1922 was her marriage with Charlie Chaplin announced but it remained with this announcement and ended with mutual public insults. At the funeral of Rudolph Valentino - her alleged lover - she collapsed with crying fits at the casket. Malicious tongues described this scene as her best perfomrance of her career. Scandals in the 20's were absolute career killers, also Pola Negri's popularity sunk continously, moreover her Polish accent was a problem for the arising sound film. Pola Negri went back to Europe and played in France and England for the time being. Only in 1935 she as successful again in Germany with "Mazurka" (35) and she was able to take part in the movies "Madame Bovary" (37), "Tango Notturno" (37) and "Die Nacht der Entscheidung" (38) in the following years. At the beginning of the war she stood in France, later she went back to the USA via Portugal where she appeared once more in a film called "Hi Diddle Diddle" (43). In 1951 she got the American nationality and took up a second successful career as a realtor. She came back to the screen only one time for Disney's movie "The Moon-Spinners - Der Millionenschatz" (64).